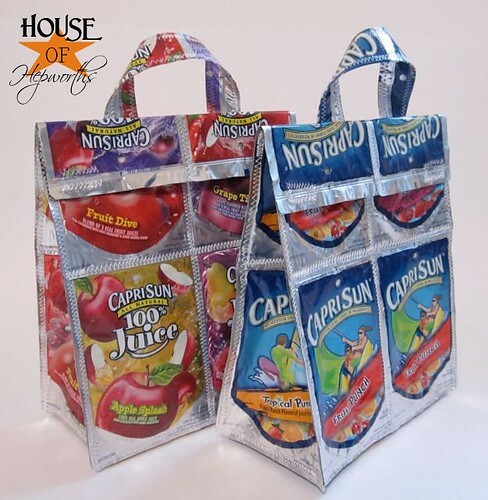 Caprisun bags & totes the hit of the school! 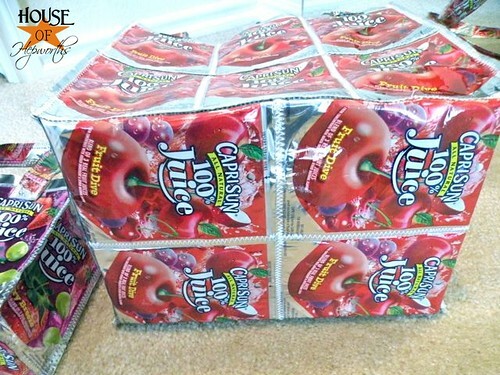 I am a little obsessed with Caprisun bags. Seriously. Are they not just the cutest things ever? I’ve streamlined my initial lunch sack. It now has a handle, less velcro, a flap closure, and is less bulky at the top. They are pretty much a huge pain in the patootie to make so I’m not going to give a play by play right now. Maybe some day. Here’s my tutorial on how to make the little bags though. 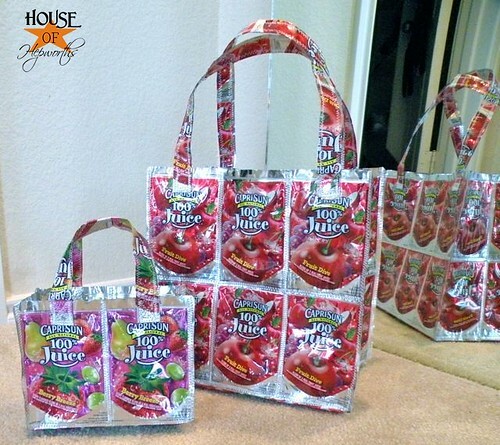 I also have been making these oh-so-cute large caprisun totes. They are great for school or going to the pool. They are much easier to make then the lunch sacks. 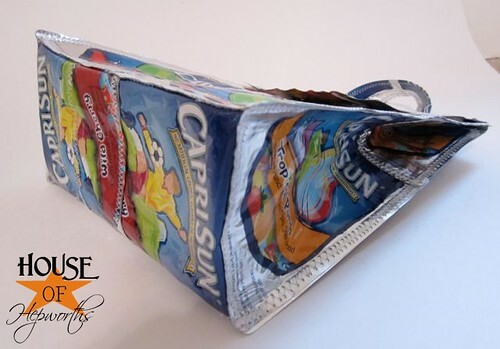 Basically use the tutorial for the small bag, but add additional pouches to the width and height to make it bigger. I’ve been planning on making a ton of bags for my etsy shop, but seriously, I have no time. Boo. Don’t bother clicking over to the shop; there’s literally NOTHING there. I made this bag for my sister Rachael for school at least 8 months ago. As you can see, it has held up great (this picture was taken just a few days ago). 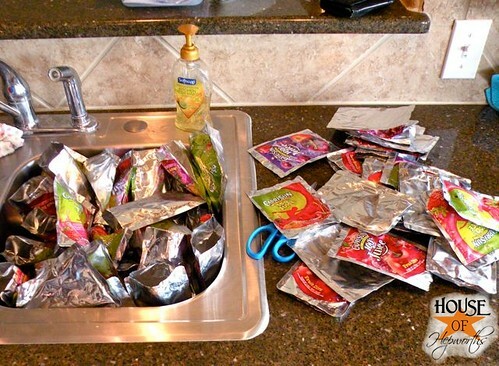 I get asked frequently how to prepare the pouches and clean them. They are pretty easy to clean. Now, to clean them properly you need to jab a pair of scissors into the bottom and cut straight across. 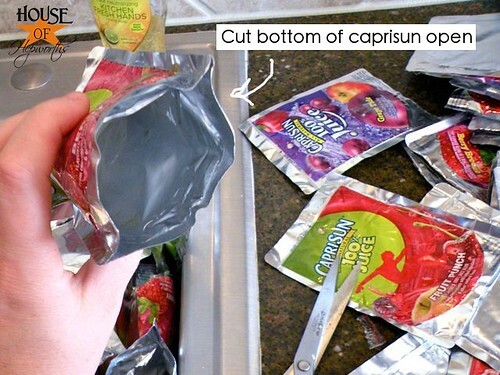 Then just tuck the extra up inside the pouch. I rinse them under the sink as I go, just because they are sticky. You probably don’t even have to pre-rinse them. 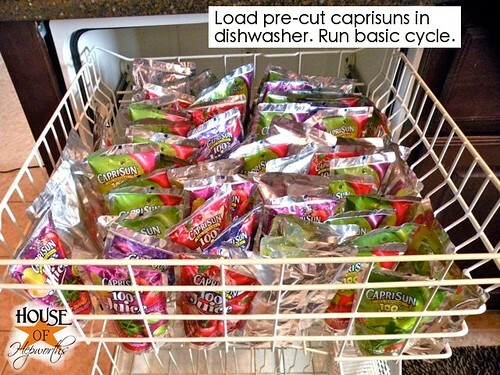 Now, make sure each pouch is open on the bottom and load up the dishwasher. For real. It’s that easy. I use both the top and bottom rack and run a standard wash cycle on them. They come out perfect every time. These bags are perfect for birthday gifts. We give them to all of Kinsey’s friends when they have a birthday. Even Travis’s friends like the lunch sacks! 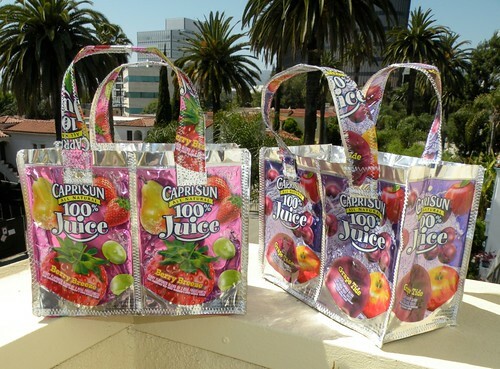 Caprisun bags are literally the hit of the school. 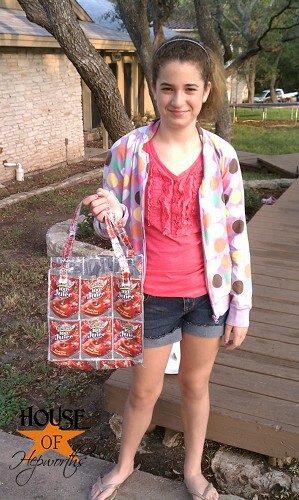 Rachael begs me to make the large totes for all her 4th grade friends. She’s gotten so into these bags that she has collected literally HUNDREDS of pouches for me over the past several months. Who knew trash would turn into something so fun and cool! 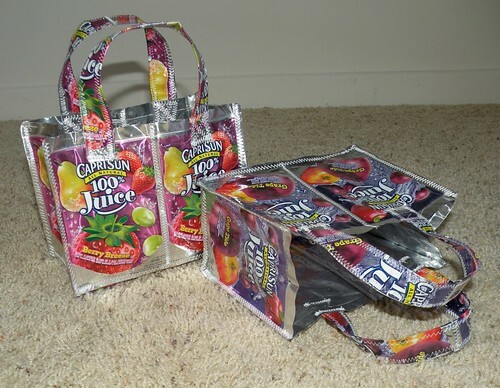 Are your kids obsessed with any crazy accessories made out of random stuff? Bottle cap necklaces, paperclip bracelets, soda pop top jewelry? LOVE those bags! I have always wished I knew how to sew and this is just one more reason. My daughter and a couple friends love making soda tab bracelets that I taught them to make with simple elastic. We are always on the lookout for ways to redusr, reuse, and recycle. I love the bags! 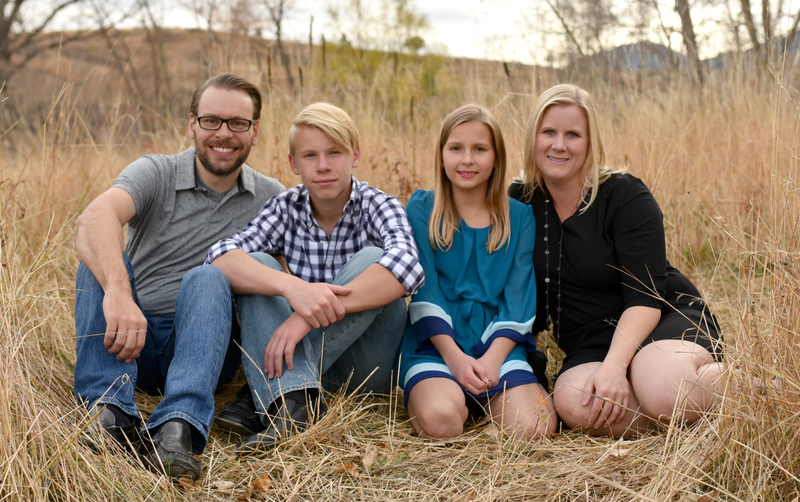 They have made great gifts! When i saw the first one Allison made in person, I LOVED IT! I said, “where on earth did you buy this from!!!!!!!!! !” I loved it! Yep these are da bomb! I stopped making them a few years back, but they are great. Made a bunch for my daughter 11th BDay 3 yrs ago as favors. They also kinda self-insulate so they are perfect for a big beach/picnic bag. Just add one of those cooler packs and you are ready to go. Have fun! 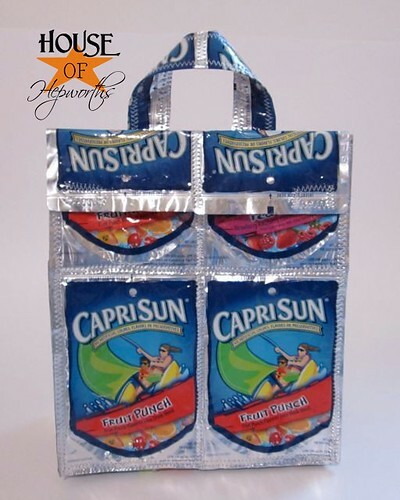 I was on a cruise last month and I saw a lady carrying around a Capri Sun Tote bag. Forgot to ask her if she got the idea from you. I wanted to make one after I saw it. 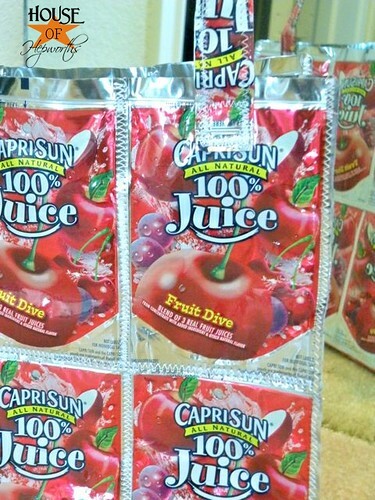 I guess we’ll need to start drinking Capri Sun now. Are these more a lightweight bag for things like stuffed animals and coloring books, or would the bigger ones hold up to heavier items? Shut. The. Front. Door. … I LOVE these!!! Could you be any more stinkin’ creative???!!! 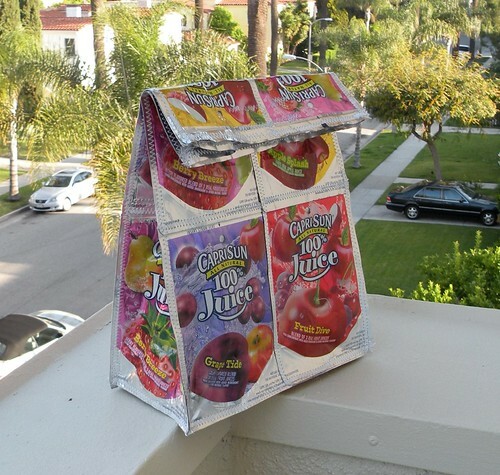 I was so inspired by your first post that I went out and bought two boxes of capri suns and made my friends drink them all. I tried to sew them but my machine is old and decrepit and I didn’t have the patience to figure out what went wrong. Instead, I used strips of yellow duct tape! It worked perfectly and has help up this entire school year. I get compliments on it everywhere and people are shocked when I tell them I made it myself! thanks! Thanks for stopping by my blog (His & Hers) and leaving a nice comment! I’ve seen them quite a bit, especially on Terracycle, which retail at Walmart and Target. 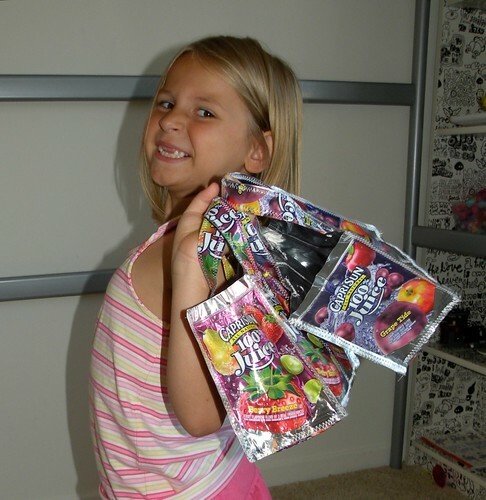 Does your school system do Terracycle? Here are their bags. 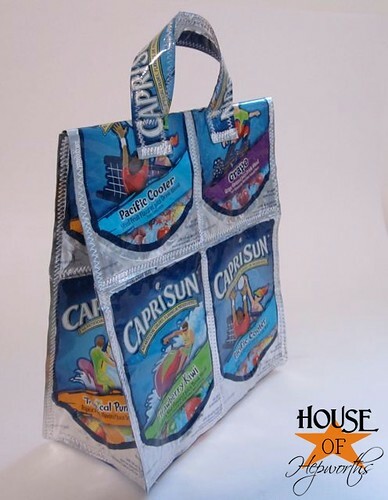 These Capri Sun small bags are great as a gift I think. My four year little girl would love these. I think I`ll make this her next gift next month on her birthday. My daughter use to give them to her friends as gifts all the time. We’d use them as gift bags also so they could end up with two gifts! They were always a hit. 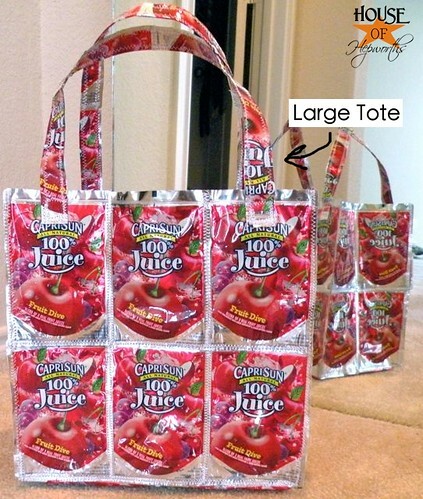 I haven’t made one in awhile but my daughter has been asking me for a big tote, so I’ll be creating a new one soon. Нi there, just wanted ttо say, I liked this post. It was practical.